Hwayong Jung is an artist and designer who specialize in digital media. Born in South Korean and currently working in the New York. He received MFA in Computer Art from School of Visual Arts in 2011. He used new technology as tool to create experience that extend and inform his creative process. It enable him to draw and re-interpret new visual experiences. He created the interactive sculpture with the environmental data and generative visual aesthetic brought by computer code and software. His works focused in making bridge and blur the line between design methodology and new technology more accessible and tangible thorough interactive media, illustration, fabrication, and installation. His works has been featured in exhibitions at BRIC Arts Media House in Brooklyn, New York, BRIC Rotunda Gallery in New York, Korean Cultural Service of New York, Festival MIDEN in Kalamata, Greece, Seoul Design Center in Seoul, Korea, Manifest Creative Research Gallery, West Side Gallery and Visual Arts Gallery in New York. Euphoria is experimental video that is depicting hyper-realistic landscape of fractal dimension infinitely regenerating as side-scrolling video. 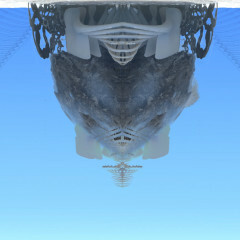 Computer-generated atmosphere, organic forms and visual images are morph and blended into live organism that continuously changes, being and reproducing. There is no beginning and ends, just generated atmosphere and organic forms in order to recreate visual aesthetic using computer code.